Let’s examine and analyze them, shall we? “This country doesn’t want them.” Like most of the quotes featured, this one lacks context, because it is much easier to claim a statement is racist when one has no idea what the statement referred to. This one is especially vague that way, inviting the readers to assume “them”means a race or a nationality. It doesn’t. The “them” this country doesn’t want, according to Trump in October 2018, was the “caravan” of people from South America trying to force their way across our inadequately guarded borders. “Them” means illegal immigrants, as well as migrants who don’t want to follow our laws and rules. That’s not racist. That fair and true: the most of the country doesn’t want people to come here who have such contempt for our laws . “You see those people taking a knee.” “Those people” means “the NFL players playing Colin Kaepernick” who happened to be primarily black. President Trump objected strenuously to this pointless, obnoxious, incoherent, divisive, grandstanding and virtue-signaling stunt (as did I—can you tell?) and said so, in his typically blunt manner. “Those people” and “you people” are popular race-baiter gotchas, but here they are even less fair than usual. Is there any question that the President would have had exactly the same reaction to the kneeling if most of the protesters had been white? There shouldn’t be. As with most of these fake “racist statements,” “resistance” critics and hack journalists are taking advantage of the President’s stunning lack of precision and clarity in his speech, as well as a vocabulary from an Ivy League school grad that consists of about 139 words. We have seen this now for going on 5 years. “A bunch of bad hombres.” What’s the theory, that it’s “racist” to use the Spanish word for “man“? Trump said, during an October 2016 debate with Hillary Clinton, “We’re going to secure the border, and once the border is secured at a later date, we’ll make a determination as to the rest. But we have some bad hombres here, and we’re gonna get ‘em out.” No matter how one interprets that statement, it’s only racist to someone who has already decided that Trump is racist, someone who wants him to be racist, who needs him to be racist. (Hold it, I was channeling Jack Nicholson there for a second..sorry.) There are bad illegal immigrants here. There are bad men who are here illegally. There are bad men here illegally from Mexico. Fact-checkers and race-baiters were all over him, but outside of being typically sloppy in his sentence construction, there’s nothing racist about anything Trump said. The New York Times protested that some of the inner cities were doing just fine, but Trump didn’t say every inner city was a mess. He said “some” too. “Trump’s concept of the inner city is about 30 years past its prime,” Nela Richardson, chief economist for national real-estate brokerage Redfin, told MarketWatch. Okay, I’ll buy that: when I was in college, “inner cities” were considered the battle ground of racial inequality, poverty and the scourge of discrimination. That was about when Trump was in school too. But being out of date and not sufficiently informed about the topic he was ranting about doesn’t make him racist, it makes him ignorant and irresponsible. “Criminals and unknown Middle Easterners.” Ugh…the caravan again: Trump tweeted that “Criminals and unknown Middle Easterners are mixed in” with the mob. The initial complaint from the news media was that Trump had “no evidence” that this was true, and was stating speculation as fact. Well. 1) That’s what Trump does regularly on every topic under the sun. Not racist. 2) It was certainly a fair and reasonable assumption. 3) Who knows what he had been told? 4) “Unknown Middle Easterners” meant potential terrorists who had not been vetted, as migrants from certain Middle Eastern countries are required by law to be. Maybe it’s time for a break. I’ll finish this in Part II. Oh, I think you are right. It’s not conspiratorial at all. 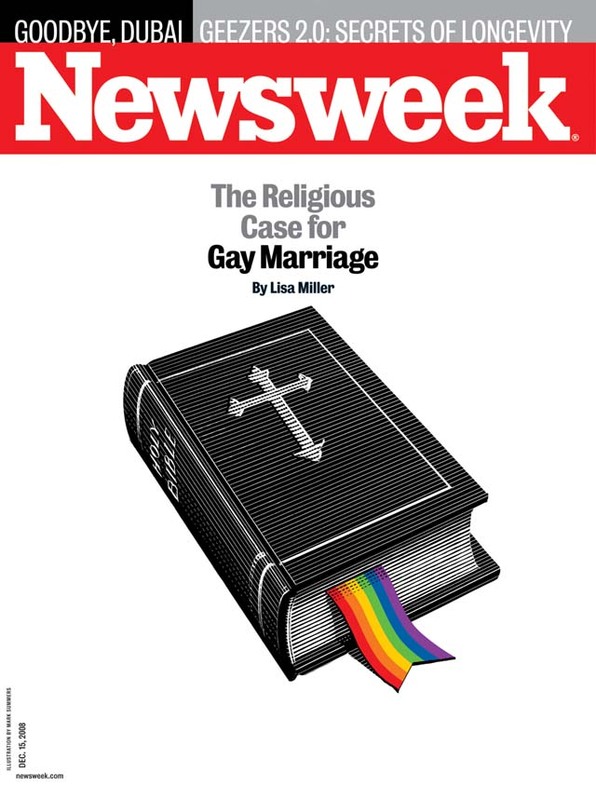 It’s an actual Newsweek cover……..I thought it was a badly done parody of some kind. Color me gobsmacked. I’ll now read both posts, I stopped short on seeing that this is a real cover. Wow. Based on that last sentence I’m eagerly waiting for you to snap and write that post about Col. Jessup being the good guy. “Our Mutual Joy: the Religious Case for Gay marriage”. What about Dianetics or the Quran?